When a business has a fleet of vehicles to manage, small savings can go a long way, especially when it comes to fuel. Fuel costs are typically the second largest expense behind vehicle depreciation. It’s clearly important for any business running a fleet of vehicles to ensure that they have robust processes in place to manage fuel expenditure. A telematics system connects your business with your team on the road. Giving you an insight into where your vehicles are located and how they are being used. This gives you access to both live and historic fleet performance data, allowing you to take action where required. You’ll gain new insights into the fuel habits of your drivers and this, in turn, will help you to explore ways to cut costs and improve your bottom line. Vehicle downtime is a huge inconvenience to any business. Whether your employee just missed a business-critical meeting or your customer was let down by a missed appointment or delivery, the ramifications to your profits and the company’s image can be vast. By servicing your fleet regularly, you can help to prevent vehicle downtime and increase fuel efficiency. In some cases, spotting and fixing a serious engine issue can improve MPG by up to 27%. Best practice shows that by getting your drivers to regularly check their vehicles, will potentially yield benefits over time. We’re all aware that the cost of fuel between different fuel stations can be vast, particularly with motorway service stations charging a premium. Therefore, it’s wise to include a list of preferred suppliers in your company vehicle policy that you’re happy for your drivers to use, i.e. supermarket fuel stations. You can use one of the many popular price comparison websites to assist with comparing fuel prices. Potentially, with the right telematics solution in place, there are integrations with fuel card providers that will allow your employees to be guided to the nearest, cheapest, preferred station to refuel and help you to enforce your vehicle policy on refuelling. 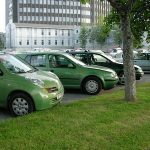 There are many benefits to having a fleet of vehicles that are driven in a sensible manner. From reducing wear and tear to reducing the risk of accidents, the benefits are far-reaching. 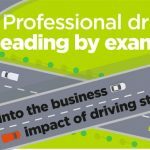 The best method to improve driver behaviour and encourage fuel-efficient driving is through educating your drivers in the practices of efficient driving. In addition to driving training schemes, it’s important to educate your drivers of their daily responsibilities such as keeping their tyres inflated to manufacturer spec, unnecessary idling, harsh acceleration and braking. Read more in our article: 10 ways to use less fuel on your daily commute. A telematics solution will help monitor your drivers driving style. This is perhaps one of the most effective ways of managing an efficient fleet as you can easily identify those drivers with particular issues and highlight those with potential room for improvement. It will help to prompt drivers in real-time on what they could be doing better on every journey, helping keep their focus on the job at hand whilst behind the wheel. Your drivers are arguably your most valuable asset. They are your eyes and ears ‘on-the-road’ so it’s vital to get insight from them. They will typically know the best shortcuts, or the cheapest fuel stations, purely from the number of hours spent on the road. An annual driver survey is an ideal way to collect data and compare results. An anonymous survey can be easily made using an online survey provider. An employee that feels valued and trusted is more likely to be an ambassador of the fleet vehicle policy. Especially if they feel their opinion is being taken into account, in a 2018 survey it was discovered that employees are at least 12% more productive if they feel valued. Some telematics solutions include driver terminals with navigation and route planning. These terminals will advise drivers on factors that will have an effect on their journey time such as traffic incidents, faster routes around congestion and road closures. Advance warnings on these potential journey delaying circumstances could help drivers drive more efficiently. In today’s connected world, there are alternatives to face-to-face meetings. In a follow up meeting, for example, your employees should be asking themselves if a conference call would suffice. Even if the odd meeting in person was replaced with a conference call, over the course of a year this could lead to significant savings for the business. We’re regularly advised by both our employers and the government to ‘switch the lights off when leaving the room’ or ‘not to waste water’. Therefore, it only seems sensible to educate your fleet drivers to be energy conscious when they’re driving too. Teaching habits such as driving smoothly, holding back on acceleration, smooth and slow cornering/braking and avoiding excessive speed is a good place to start. As mentioned earlier, there are telematics solutions that can aid this in real time by providing drivers with suggestions on improving driving style. Some of the tips may seem slight in the big picture of fleet management, but paying attention to details can add up to large savings. One such business that implemented a successful driver monitoring tool was SGN. SGN tested the TomTom WEBFLEET fleet management system and OptiDrive 360 on 100 vehicles, the trial saw reduction in fuel wastage by 68% and improved average fuel consumption by 11%. Read the full case study here. So how much do you think you can you save? The information in this blog post is meant for reference only. TomTom Telematics does not warrant or imply that the use of this text or its products or services can in itself guarantee compliance with your tax or legal obligations. To ensure compliance with these obligations you must always seek individual advice from a legal counsel or a qualified tax compliance specialist.